Abergavenny Arts Festival will be taking place Friday 29th June to Sunday 1st July 2018. Abergavenny Arts Festival will showcase amateur and professional artists from the vibrant local arts scene, as well as inviting some exciting artists and art practitioners from further afield. Abergavenny is situated on the edge of the scenic Brecon Beacons National Park. The theme for the 2018 festival is water, complementing the Welsh tourism theme, ‘Year of the Sea’. Locals, families, groups, schools, businesses and visitors of all ages, abilities and artistic tastes will be able to join in this celebration of the arts. The programme is currently being curated and artists and arts practitioners who may wish to exhibit practise or perform are welcome to get in touch. The festival will include painting, dance, drawing, sculpture, theatre, photography, performance, film, poetry, music and comedy as well as street performances and interactive artistic experiences. There will also be displays of the results of several competitions. As well as exhibitions and performances, there will be plenty of opportunities to ‘give it a go’ with workshops and creative craft sessions. 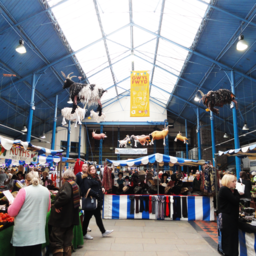 Abergavenny is renowned as a market town, and street stalls will feature prominently, with artists’ works, gifts and souvenirs, and delicious food and produce available to take home. Abergavenny Arts Festival is supported by a growing network of artists, community groups, volunteers, businesses, sponsors and friends. The festival has applied for charitable status and wishes to include the widest audience possible to create an arts festival that can be enjoyed by all. To get more up to date info on this exciting event, please visit abergavennyartsfestival.com where there will be updates on the lineup, essential info and tickets. You can also sign up to the email newsletter via the website. If you are an artist, an actor or a creator and would like to get involved, please email artsabergavenny@gmail.com with ‘Creative’ in the subject line. Abergavenny Arts Festival are very grateful for the financial and practical support being offered by Friends, Donors and Sponsors. If you are interested in supporting the Festival in this way, please contact artsabergavenny@gmail.com with ‘Friends, Donors and Sponsors’ in the subject line. Previous ArticleCan you help with the Abergavenny Arts Festival Artisan Fashion Show Fundraiser?